This month we are thrilled to announce our mom of the month, Meagan. Meagan is a FIT4BABY pre-natal client with us. She has the biggest smile on her face during classes and has truly just jumped right into FIT4MOM. This is her first pregnancy and she found us of course on Facebook. ;) Welcome to Our Village Meagan! We absolutely love you and can't wait to meet your sweet baby this summer!! Hometown: I grew up in Lombard! Moved to Forest Park after getting married and we recently bought a house in Lombard and moved back! 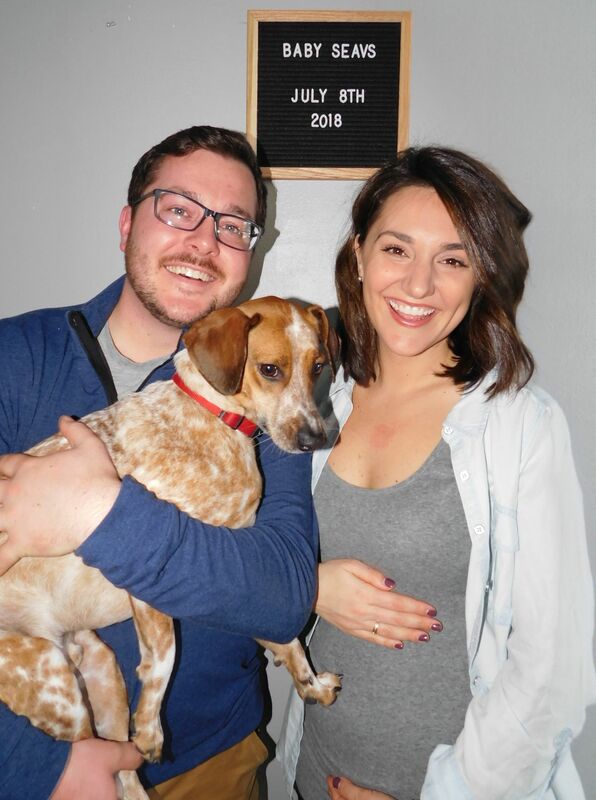 Tell us about who is in your family: My husband of almost 3 years, Austin and our 1 year old Heeler/Beagle mix named Lenny! Current/Previous career: I am in my 6th year of teaching in Westmont! I have been teaching 3rd grade for the past 2 years and absolutely love it! I have also been a Reading Specialist and taught 4th grade. What was your childhood ambition? I have always wanted to be a teacher. I had a whole classroom setup, complete with a chalkboard! I embarrassingly played "teacher" (with chocolate milk in my mug instead of coffee!) until I was in 8th grade! What does motherhood mean to you? Experiencing the most unimaginable and unconditional love there is. It's a very scary, exciting and fulfilling adventure that my husband and I are so ready to take part in. What is the furthest you have been away from home? We went to Costa Rica on our honeymoon! We zip-lined in the rainforest, hiked, and walked across some very high hanging-bridges! How did you find FIT4MOM? Right before I got pregnant, I saw a post from a friend on Facebook. I took a screenshot and saved it in my phone for when I would be able to join! As soon as I passed 8 weeks, I signed up! How as FIT4MOM changed your life? It is so easy to feel sluggish in pregnancy. This class has helped me remember to still take care of myself, and it gives me that extra confidence I am lacking on my not so great pregnancy days! I have also met some of the friendliest mamas-to-be and experienced moms who have wonderful advice to share. I am so excited to continue with the F4M family and to develop strong friendships! Favorite exercise: I love anything that involves working my biceps and triceps. It's where I feel the most "burn"! Proudest moment: My proudest moment is definitely all the small, daily rewards that come from teaching. I am able to build strong relationships with my students, and I love when they come back to visit! I taught 4th grade my very first year, and they are now freshman in high school. Not only did they attend my wedding ceremony, but they still come back to visit regularly. And some will be babysitters for our sweet baby! Tell us something about yourself that would surprise us: I have had a yellow Jeep Wrangler since I was 17 years old. I have been to "Camp Jeep" In Pennsylvania and Wisconsin to do some extreme off-roading! Want to try a pre-natal workout class with us for free? Just fill out this quick form and we'll get back to you ASAP!